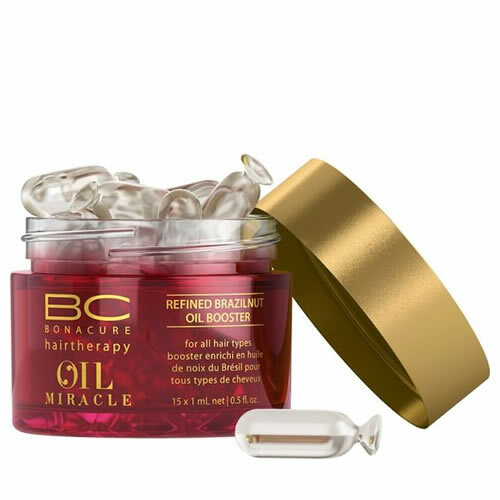 Schwarzkopf BC Bonacure Oil Miracle Refined Brazilnut Oil Booster is designed to boost the caring results of Bonacure Oil Miracle Brazilnut Oil Pulp Treatment. Suitable for all hair types, Oil Booster provides indulgent care, offering superior nourishment, opulent shine and suppleness while delivering unprecedented colour brilliance and protection. Each 1-ml capsule can also be used as a deep-nourishing pre-shampoo treatment for fine hair. Simply pour the contents into your palm, rub and apply to lengths and ends of hair. Leave in for 10 minutes (or overnight) and then rinse off with warm water. To boost BC Oil Miracle Brazilnut Oil Pulp Treatment, simply mix 1 capsule with 30 ml of Pulp Treatment, then work through mid-lengths and ends of towel-dried hair. Leave in for 10 minutes and then rinse off with warm water. Pot contains 15 x 1-ml capsules. £21.36 (inc. VAT) Why no VAT? We're a trade wholesaler and quote our prices without VAT to help our VAT-registered customers understand the true cost of a purchase.